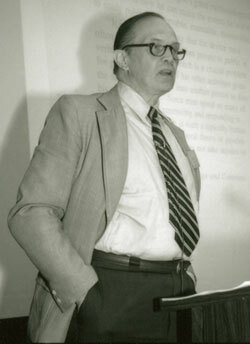 George A. Miller delivers the keynote address, "The Place of Language in a Scientific Psychology," at the first APS Annual Convention in 1989. Miller, who passed away on July 22, 2012, was also a leader in the study of short-term memory and linguistics. In the Keynote Address that he delivered at the first APS Annual Convention in 1989, Miller said that language must be a key element of any theory of psychology because it is a means of making private or internal psychological phenomena observable, measurable, and public. His linguistic work continues to endure through WorldNet, a publicly-available lexical database of the English language, which has been applied to the development of search engines and translating programs. The 1956 paper ‘The Magical Number Seven, Plus or Minus Two’ is Miller’s most famous, and remains one of the most frequently cited papers in the history of psychology. In this classic of cognitive psychology, Miller proposed that short-term memory is subject to certain limits including span and the quantity of information that can be stored at a given time. For more, read this New York Times article George A. Miller, a Pioneer in Cognitive Psychology, Is Dead at 92.